Among the two coffee table books on the Sunderbans to hit the bookstores this year--this one has the distinction of being compiled by two persons with the right credentials to write about the world's largest mangrove expanse. Biswajit Roy Chowdhury, who's shot most of the photographs in the book, is a noted conservationist, wildlife photographer and writer, who has spent 15 years working in the villages and mangrove forests of the Sunderbans, painstakingly documenting not only the local flora and fauna, but also the life and culture of the deltaic regions' human inhabitants. Co-author Pradeep Vyas, is former director of the Sunderbans Tiger Reserve who's known for his efforts to minimize human-tiger conflicts and promote anti-poaching activities in the Sunderbans. The 119-page book is packed with photographs and informed commentary on the history and amazing bio-diversity of this immense archipelago of islands by the Bay of Bengal and the maze of tidal rivers that crisscross them. 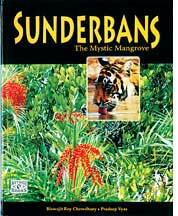 The Sunderbans mangroves are home to over 100 plant species and a variety of animals including the protected Royal Bengal Tigers, estuarine crocodiles, sharks, spotted deer, wild boar, gangetic dolphins, otters, Olive Ridley turtles and several species of birds and snakes. For these reasons, the Sundarbans National Park in India and the Bangladesh part of the Sunderbans were inscribed on the World Heritage list in 1987 and 1997 respectively. In recent times, scientific reports have suggested that climate change and human interference have imperilled much of the Sunderbans. Sea-level rise is the greatest threat to the island and its biodiversity. The book succeeds in so far as documenting the diversity that's at risk and highlighting the forest authorities' conservation efforts, but aesthetically it fails to convey the very sense of mystique that the title peddles. The layout and presentation of photographs, the interplay of text and images could have been improved upon. As such, it just seems to highlight how little consideration the publishers have given to transforming the rich available content into book form.